Belying its apparent simplicity, this latest album from Kit — basically a piano album with some supporting synth work, recalls the ethereal spirit and moodiness of his classic Azure. The key to the success of this album lies in its emotional content, reflected in the compositions, performance and arrangement. One would not normally think a piano album would pack this kind of power, yet judiciously applied studio techniques and synthesizer parts transform each of these introspective pieces into shimmering gems, full of warmth, delicacy, and a mystical dreaminess. Much of the material drifts through repetitive cycles where melodics play a secondary role to the overall texture, patterns, and underlying structures. Sampled soprano sax solos float over the liquid framework on many of the tunes, offering counterpoint and dynamic balance. Much like a watercolor painting, the absence of bright tonal color in favor of a more subtly complex and blended approach creates a certain sparseness to passages — a technique that Watkins first used in his HTM days on tracks like "Ibby It Is" and has mastered and perfected over his career. 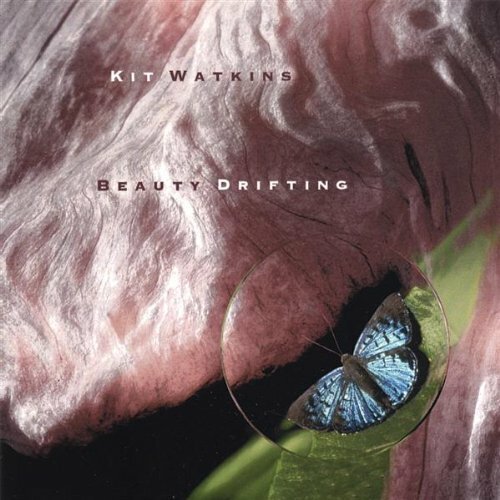 All taken, Beauty Drifting seems to be a very appropriate title for the album, yet another in a long line of winners from Watkins. The title of this work is as apt a description as you'll come by for this music. Using mostly grand piano, electronic treatments, a mite of sampling, and a nice sense of space, Kit has fashioned an ambient recording along similar lines to Harold Budd and Brian Eno's Plateaux of Mirror. In my opinion this style works best when it utilizes a minimum of melodic and harmonic motion. Sensitivity to repetition is equally important. And that is exactly what he has done; eschewing any kind of syrupy sweet melodies, chord progressions or song structures. My only point of dissent would be that I think an acoustic saxophone might have injected a little more venom into it. But placidity and tranquility are of paramount importance here. Like a watercolor painting or a study in pastel shading, this is an impressionistic work that captures imagery of falling snow, caverns, ripples of sand, and contrasts of light and dark. Kit is quite a prolific composer. A musical chameleon of sorts, he seems loath to getting stuck in any one manner of expression. I haven't always been able to keep up with his output, so I'm glad to have the chance to hear Beauty Drifting. I believe he's hit upon a style that will reveal more fruits. This one was a real surprise. Watkins has always had a broad body of work in the electronic realm, but this album is something very different from his last few efforts, ambient or rhythmic. Beauty Drifting is centered about grand and electric piano pieces, accented with VL1 Virtual Acoustic synthesizer lead lines. There is no overt sequencing or percussion. A Different View from a few years back allowed Watkins to interpret some classical pieces, a lot of which were written by Satie. That influence shows very strong here as well. However, this is not your typical new age solo piano album. It's far too atmospheric to fall in that category. Some of that is due to the fact that much of the piano is drenched in reverb. Get out your towels, this one's wet. Ex-Happy the Man core member Frank Wyatt had written a tune in the early 80s which appears here for the first time, and it's a gem. But the greatest moment of all is on the second-to-last track, "Angels We Have Known." Here, Watkins opens up in a long free-form improvised solo with a Prophet-like flugelhorn patch that could easily be his best solo since Camel's "Ice." While the album probably isn't overall as strong as his last, Holographic Tapestries, or his first and best yet Azure, Kit Watkins continues to explore new boundaries in his music, and his sheer gift for composition hasn't dulled a single bit. Kudos to Kit for another great effort.